Sarah says: This is a lovely way to help children anticipate starting school. I must admit the idea is not mine though, 25 years after I started school I can still picture the one I made with my mum, using an old cereal box as the backing. From the coloured paper cut out scraps to make a house and a school. Lay these on the A3 paper, the house in the top left, school bottom right. From black paper cut 14 (or however many days you intend to count down for) rectangles. Lay these on the paper so they form a path from home to school. When you are happy glue everything in place. Use coloured pens to add windows and other details. 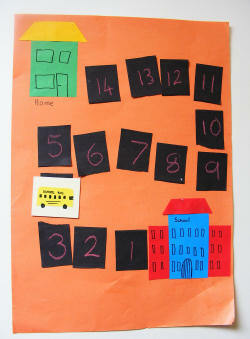 On the black rectangles write numbers, starting at the house with 14 and counting down to 1 next to the school. Glue the photo on to the scrap of card. Alternatively you could draw yourself or a school bus. Pin the paper up, and stick the card to the house with stick tack. Every day as the time gets closer to starting school move the card one space closer to the school.